Lundin Gold Begins Drill Program at El Puma Target | Lundin Gold Inc.
VANCOUVER, BRITISH COLUMBIA--(Marketwired - Nov. 17, 2017) - Lundin Gold Inc. ("Lundin Gold" or the "Company") (TSX:LUG)(OMX:LUG) is pleased to announce that it has begun an exploration drill program at the El Puma target ("El Puma"). 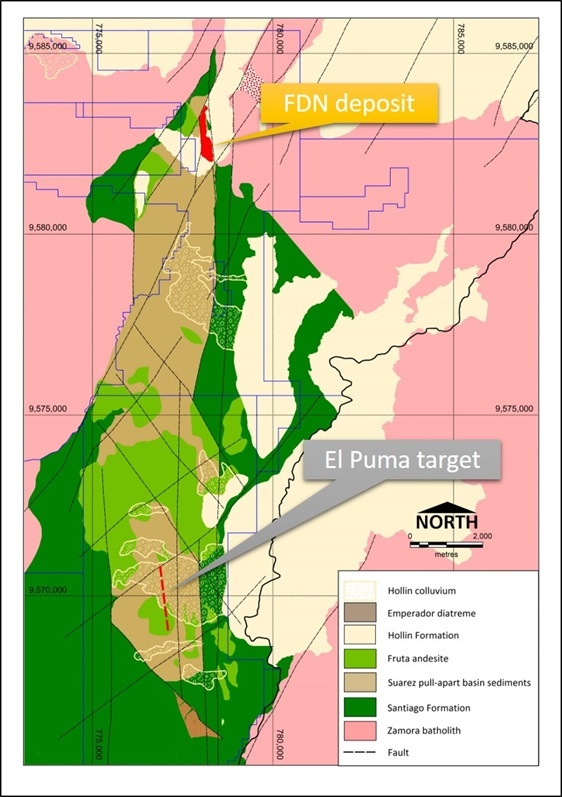 El Puma is located approximately 12 kilometres ("km") south of the Fruta del Norte gold project ("Fruta del Norte") in Ecuador, within the Suarez pull-apart basin (the "Basin"), see Figure 1. Under the program, expected to be completed in early 2018, Lundin Gold has planned 4,000 metres of diamond drilling. "Follow up drill testing at this prospective target is being led by Steve Leary, the former Exploration Manager of Aurelian Resources, Inc.," said Ron Hochstein, President and CEO of Lundin Gold. "We have brought together most of the original Aurelian exploration team that was part of the initial discovery of Fruta del Norte, which is critical given the complex nature of these deposits." Soil sampling and two drill holes completed during Lundin Gold's 2016 exploration drilling campaign indicate that El Puma has a similar epithermal geochemical signature to Fruta del Norte, primarily the epithermal pathfinder elements arsenic and antimony and alteration within the Basin's sediments, which is interpreted to be associated with a buried epithermal system. The Basin hosts Fruta del Norte at the northern end and was originally extended eight km south of Fruta del Norte; however, drilling and mapping carried out by the Company in 2016 doubled the Basin's length to 16 km. The Company considers the Basin to be highly prospective as the epithermal ore forming conditions present at Fruta del Norte are interpreted to potentially occur elsewhere within the Basin. This news release has been reviewed and approved by Stephen Leary, MAusIMM CP(Geo), a consultant to the Company, who is a Qualified Person under National Instrument 43-101. The information in this release is subject to the disclosure requirements of Lundin Gold under the EU Market Abuse Regulation and the Swedish Securities Markets Act. This information was publicly communicated at 5:00 am Pacific Time on November 17, 2017. Certain of the statements in this press release are considered "forward-looking information" or "forward-looking statements" as those terms are defined under Canadian securities laws (collectively referred to as "forward-looking statements"). Any statements that express or involve discussions with respect to predictions, expectations, beliefs, plans, projections, objectives, assumptions or future events or performance (often, but not always, identified by words or phrases such as "believes", "anticipates", "expects", "is expected", "scheduled", "estimates", "pending", "intends", "plans", "forecasts", "targets", or "hopes", or variations of such words and phrases or statements that certain actions, events or results "may", "could", "would", "will", "should" "might", "will be taken", or "occur" and similar expressions) are not statements of historical fact and may be forward-looking statements. By their nature, forward-looking statements involve assumptions, inherent risks and uncertainties, many of which are difficult to predict, and are usually beyond the control of management, that could cause actual results to be materially different from those expressed by these forward-looking statements. Lundin Gold believes that the expectations reflected in these forward-looking statements are reasonable, but no assurance can be given that these expectations will prove to be correct. Forward-looking statements should not be unduly relied upon. This information speaks only as of the date of this press release, and the Company will not necessarily update this information, unless required to do so by securities laws. This press release contains forward-looking information in a number of places, such as in statements pertaining to the Company's exploration (including drilling) and evaluation activities, plans and objectives and potential geological trends. Lundin Gold's actual results could differ materially from those anticipated. Management has identified the following risk factors which could have a material impact on the Company or the trading price of its shares: the ability to arrange financing and the risk to shareholders of dilution from future equity financings; risks related to carrying on business in an emerging market such as possible government instability and civil turmoil and economic instability; volatility in the price of gold; the timely receipt of regulatory approvals, permits and licenses; risks associated with the performance of the Company's contractors; risks inherent in the development of an underground mine; deficient or vulnerable title to mining concessions and surface rights; shortages of resources, such as labour, and the dependence on key personnel; risks associated with the Company's community relationships; unreliable infrastructure and local opposition to mining; volatility in the market price of the Company's shares; uncertainty with the tax regime in Ecuador; measures required to protect endangered species; difficulty complying with changing government regulations and policies, including without limitation, compliance with environment, health and safety regulations, and the cost of compliance or failure to comply with applicable laws; exploration and development risks; the accuracy of the Mineral Reserve and Resource estimates for FDN and the Company's reliance on one project; the Company's lack of operating history in Ecuador; illegal mining; uncertainty as to reclamation and decommissioning; adverse global economic conditions; risks associated with the Company's information systems; the inadequacy of insurance; risks of bribery or corruption; the potential for litigation; limits of disclosure and internal controls; and the potential influence of the Company's largest shareholders. There can be no assurance that such statements will prove to be accurate, as Lundin Gold's actual results and future events could differ materially from those anticipated in this forward-looking information as a result of the factors discussed in the "Risk Factors" section in Lundin Gold's Annual Information Form for the financial year ended December 2016, which is available on SEDAR at www.sedar.com. To view Figure 1, please visit the following link: http://www.marketwire.com/library/20171116-lug1117fig1_full.jpg.